I am a food blogger and Nutella is my muse. At least some of the time, anyway. Usually before noon. It has been this way since the beginning of Veg Girl RD. In fact my third ever blog post was an ode to this creamy brown stuff. That was two years ago and it’s still hanging on as one of my most popular posts on the site. There are others like me. I see the make-your-own Nutella recipes and chocolate-hazelnut-inspired Pinterest pages. I see the bucket-sized containers of it at Costco. But, despite the company’s best advertising efforts to convince you otherwise, it isn’t exactly health food, so I’m most inspired by those trying to create a healthier version, either commercially or in their home kitchen. 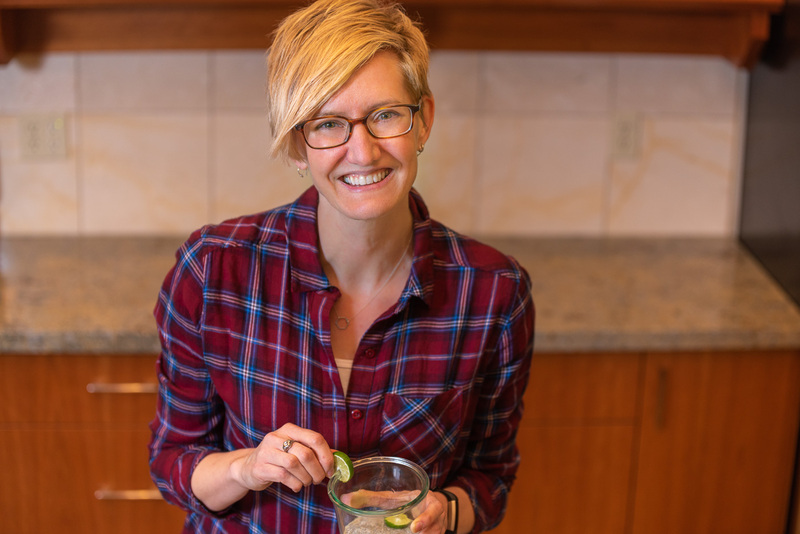 I’m always ready and willing to try a new product or recipe so I can be sure I’ve sampled all of the possibilities. That means I’ve bought a lot of jars and had a lot of taste tests. In fact, I have so much to say about chocolate-hazelnut spreads, it’s taken me three posts to get it all down on paper. (Get it all typed on the screen? Entered into my content-management system? You know what I mean.) In my ongoing quest to find a somewhat more nutritious version of this spread on grocery store shelves, I’ve acquired a handful of new discoveries to add to the ongoing conversation. 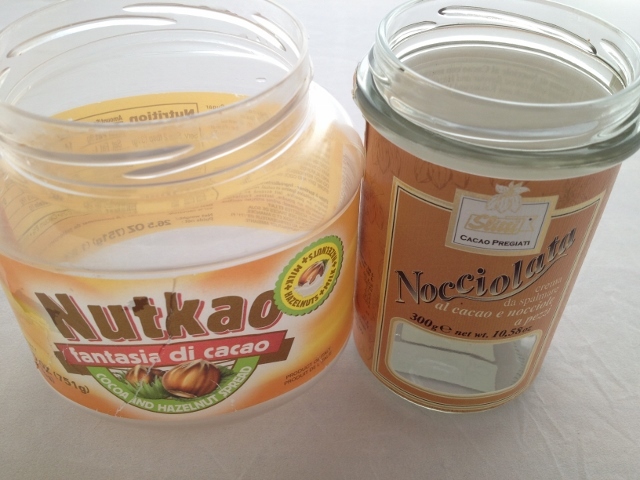 In the first post I tackled the original Ferrero Nutella, Cocoa Haze! Nut and Cocoa Spread, and Rigoni di Asiago Nocciolata Organic Hazelnut Spread with Cocoa and Milk, but my recommended brand was Justin’s Chocolate Hazelnut Butter Blend. In part 2, I took a peek at some new kids on the block: Choc & Nut Hazelnut-Cashew Nut-Cocoa Organic Spread, and Dundee Orchards Chocolate Huckleberry Hazelnut Butter, but Askinosie Chocolate Hazelnut Spread came out on top. We should probably start by addressing taste, since it’s really the only reason anyone cares about Nutella or its imitators in the first place. Rawtella is equally as good as my favorite from post #2, Askinosie. The spread from Jem was very, very soft and smooth with a texture quite similar to Nutella but with a slightly tangy flavor and I’d rate it as my second best. Nut-Tritious has a less refined texture. It’s more like a homemade version, with little chunks of nuts, but it’s yummy and definitely gets the “prettiest spread” award. It you look at the underside of the container it’s marbled with dark and light, all yin-yangy and awesome. (I tried to document the awesomeness with a picture. I failed. Guess you’ll have to rely on my spot-on literary description instead.) And while most of these spreads specifically say “don’t refrigerate” it’s actually encouraged for this fresh product, so it won’t be in the same section of the store just sitting on the shelf with the others. If imitation is the sincerest form of flattery, the Ferrero company might be starting to get a big head. The other four products I tested were extremely reminiscent of the hazelnut spread trailblazer that started it all, in terms of taste and texture: ultra creamy and very sweet. So, they should come out ahead in this comparison, right? They would if that was my only concern, but when you dig a little deeper, it’s easy to see they fall short nutritionally. 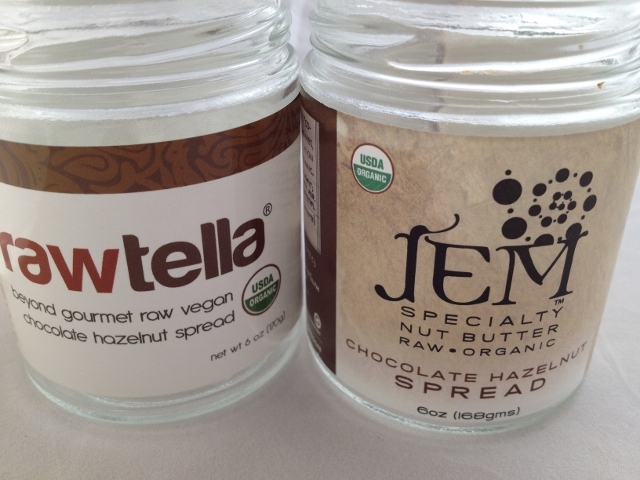 Rawtella and Jem win for fewest ingredients: hazelnuts, cacao nibs, and coconut sugar. Jem sprouts their hazelnuts and adds vanilla to the mix, but otherwise they’re almost identical. Next in terms of simplicity would be Nut-Tritious which is made with hazelnuts, sunflower seeds, flax seed meal, canola oil, cocoa and agave nectar. Remember, ingredients are listed in order of weight on the label, so whatever is listed first is present in the largest amount. The following examples look quite a bit different and clearly take their lead from Nutella, which is made with sugar, palm oil, hazelnuts, cocoa, skim milk, minerals, whey, soy lecithin and artificial vanilla flavor. You might have noticed that only three of these ingredient lists start with hazelnuts, while the other four start with sugar. 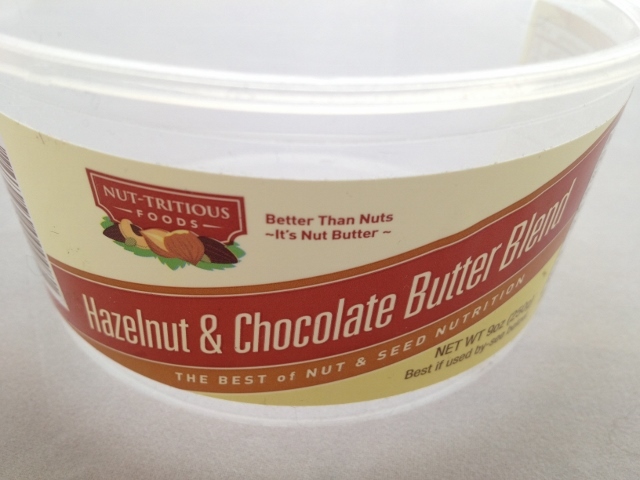 Justin’s, a competitor, suggests this makes some chocolate-hazelnut spreads more like frosting than nut butter. You can see this ingredient difference reflected in the lower protein and higher sugar contents in the nutrient table below. Since we’re looking closely at ingredients, we should talk about palm oil. A few of the comments on my earlier posts asked about palm-free options in this category of products. Nutritionally, palm is a concern because it’s a saturated fat, which has some associated health concerns. However, most of the saturated fats we think of as harmful come almost exclusively from animal foods. So palm oil seems to spark a lot of hope that research might eventually move it (and it’s cousin, coconut oil) over to the “good fat” column. But, there’s more to the story. Even if it turns out to be a healthful fat in the kitchen, the way it’s currently produced/harvested threatens tropical forests and wildlife. So if we’re evaluating products more thoroughly, palm-free or sustainably sourced palm might be worth consideration. I didn’t include cholesterol values in the charts since all the products are essentially cholesterol-free (0 mg or <5 mg). I’m curious about some of the values listed for the Nut-Tritious. For example, I’m not sure why the fat and calories are so much higher. It might be because they use sunflower seeds and flax, but based on the ingredient list I still think it’s a good choice. Vegan Milk isn't in the ingredient list but label warns "may contain traces of milk". Contains Palm Oil X X X Just lists vegetable fat, so not able to say for sure. 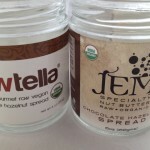 Jem and Rawtella are my recommendations because of taste and nutrition, but they’re not exactly cheap. So, if I factored that in, I’d pick Nut-Tritious because it’s a close runner-up and beats them both for cost. But, availability for all of these is spotty. You might have to become a dedicated, observant and attentive shopper who is on the lookout for Nutella impersonators in unexpected places. Or order online. But the demand is high and the desire is widespread, so hopefully more healthy alternatives will continue to enter the marketplace and ultimately be easy to come by. Maybe if we start buying up these healthier versions en masse, they’ll eventually end up in bucket-sized quantities at Costco, too. Any good products I’ve missed or suggestions for the highly probable Nutella post #4? I’ve been a nutella fan since I was a little kid. We used to buy it in tiny little boxes for a quarter. I’ve recently introduced it to my kids and they love it as well. I’m so loyal to the brand, I’m not sure I could try a different one. Hi Xiomara. I agree – it’s hard to consider an alternative to the original. With something so yummy as Nutella, you’re always comparing the taste and texture and it’s not easy finding a product that measures up. Thanks for stopping by the site to comment. I came across your original article by accident. 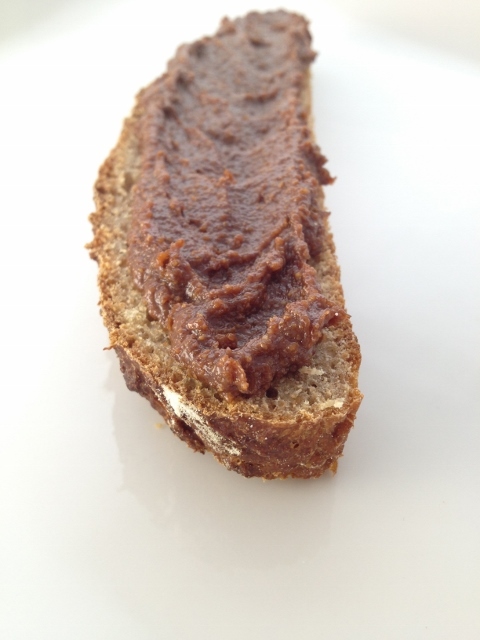 I was searching for nutrients on Nutella – since I’d bought a jar of one of their competitors (La Perla) recently. 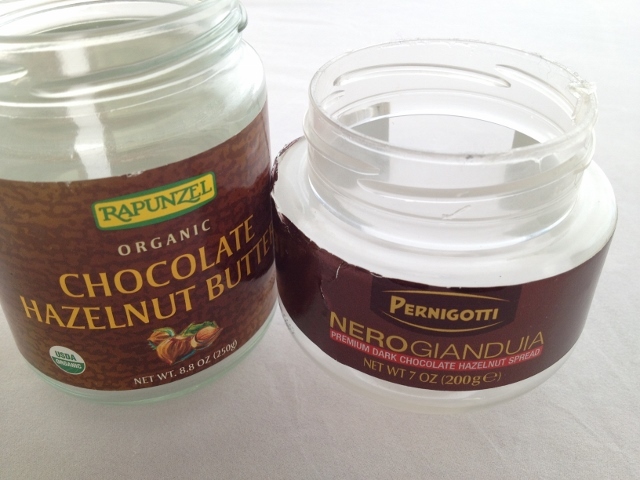 I was doing this while coming out of a low blood sugar (oh – I’m a Type 1 diabetic of 1/2 a century – that sometimes has a low in the middle of the night – so I like to usually follow up after engulfing something sweet with a tsp of peanut butter … this time it was the hazelnut / cocoa spread from La Perla). All I can say – your blogs – very eye opening – and BTW – the La Perla – evil sugar/fat stuff – scarier in nutrients than any of the other ones you mention. Hi Anna. I’m so very glad you found something useful in this post. Geez, 30 mg/dl is awfully low. But, it sounds like you know when to expect a low blood sugar and I’m glad you have a good plan in place to fix them. FYI, Coconut oil is a healthy fat and has been considered so for a while now. You can read about it’s numerous health benefits on many reputable websites. Thanks for an otherwise great post! Hi Niki. Thanks for the comment about coconut oil. I know it’s been touted as sort of a super food recently, but I’m not sure the science has quite caught up with the buzz. The sources I rely on still classify it as a saturated fat, so I do as well. That means it should be limited in the diet in favor of unsaturated or liquid fats. However, since it is a plant source of saturated fat I certainly won’t be surprised if we find it to be a more reasonable choice than saturated fats from animal sources as we learn more of the story. I’ve got some in my kitchen and I use it sparingly, but the dietitian in me hasn’t yet given it the seal of approval as a recommended choice. I’d love to read more about the positives, if you want to point me towards the sources you mentioned. Many thanks. Our usual go-to is Nocciolata for its smooth texture and not-so-bad formula, but the Amedei is INTENSELY WONDERFUL. Hi Joan. A recommendation for yummy hazelnut spread can never be too late. 🙂 I will definitely check it out! HI KRISTINE! SORRY FOR MY ENGLISH. I AM A SOUTH-AMERICAN VEGETARIAN. HERE IN BRAZIL THE NUTELLA CREAM (and the FERRERO ROCHER famous bombons) ARE MANUFACTURED LOCALLY, BEING ALMOST THE SAME TASTE AS THE ITALIAN ONES. ADDITIONALLY, MY FAVOURITE HAZELNUT/CACAO CREAM IS THE ONE AVAILABLE ON THE US WHOLEFOODS stores. I BOUGHT IT WHEN I TRAVELED TO THE US. BUT TE MAIN CONCEPT I SHALL COMMENT TO YOU IS THE FOLLOWING: PLEASE be informed about the TREMENDOUS, BRAVE AND PERFECT LABOUR done by the SCIENTIFIC EMINENCE, “Dr. STEFAN LANKA”… and also, be informed about the books written by “MANUEL LEZAETA ACHARAN” (a Chilean brave and very intelligent LAWYER) because both persons contribute SAVING MILLIONS OF LIVES around the world and make people OPEN THEIR EYES! Best regards and congratulations for your great work! Hi Adrian. Thanks so much for your comment. I guess I shouldn’t be surprised that Nutella is known around the world! Hello! I read all three of your lists on Nutella and its copycats. Thanks for researching this and sharing. I stopped having Nutella years ago as soon as J learned it was bad for you. But, until today, I didn’t really know why it is unrecommendable. So, mm take away from your posts is to make my own. I will probably use one or more of the recipes you posted and then come up with one of my own. If/when I do, and, if it is any good, I will share it with you. Thank you! Hi Miles. Thanks so much for your comment. I absolutely want to hear back if you come up with your own recipe. We can’t have too many healthy alternatives as far as I’m concerned.